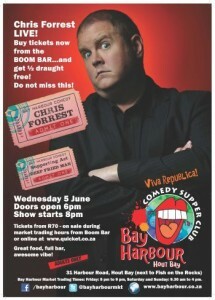 SA comedy legend Chris Forrest brings his unique brand of humour to the Bay Harbour stage on Wednesday 5 June 2013, alongside musical comedian Deep Fried Man.Get your hands on a scrumptious dinner and enjoy a fantastic night of side-splitting laughs and great entertainment. Chris Forrest’s introduction to comedy in 1999 was “a combination of trying to impress a girl and winning a six pack of beer.” Since then he has gone on to become one of SA’s most versatile and recognisable comedic figures. Inspired by a range of comics from Jimmy Carr to Eddie Izzard, he is the deadpan face of South African comedy that everyone loves. 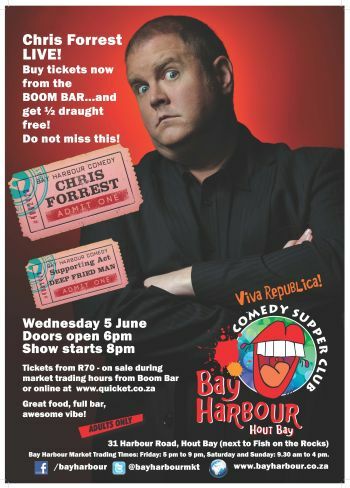 Chris’ unique, dry sense of humour has made him one of the country’s most popular comedians and ensures that audiences are left in stitches wherever he goes. When asked what the future of SA comedy looks like, Chris responded with “It’s oval and mostly orange with a hint of grey”. Chris has also been a regular performer on South Africa’s premier comedy show The Heavyweight Comedy Jam, which tours the country on a regular basis, as well as being an honorary black man on the hugely successful Blacks Only Show, which has revolutionised comedy in SA. 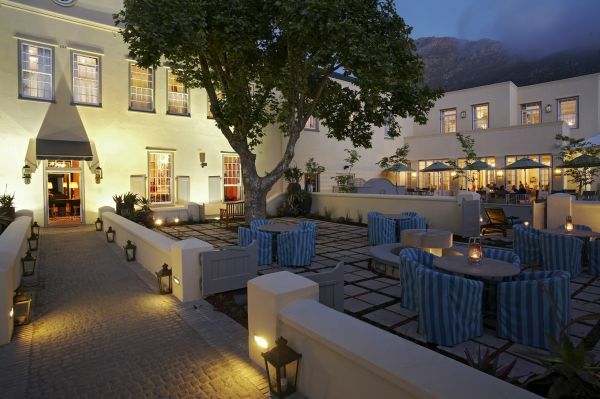 Chris is also the regular host of the King Size Comedy Shows, attracting crowds of three thousand plus. Chris also played the famous Lyric Theatre in West End, London to huge acclaim. Award-winning musical comedian Deep Fried Man was dropped on his head several times as a young child, and this has had a profound effect on his song-writing style. He started out as a serious musician, and realising that the audience was laughing at him, he decided to try and at least make them laugh on purpose. He has been rocking comedy gigs all around the country ever since performing at some of South Africa’s biggest comedy events – the Nando’s Jozi Comedy Fest, Heavyweight Comedy Jam, Mind the Gap and LNN Live at the Lyric Theatre to name a few. Doors open at 6pm, show starts at 8pm – tickets R70 standing or R90 reserved seating.